Tuesday morning after breakfast Steve, Monicka and I went up to see the vet checks so that the two of them could get a sense of layout for the day of the ride. The trip to Robinson takes about an hour and a half; it’s a windy mountain road passing through many tall green pines, small mining towns and areas that are open enough you can take a gander at the wilderness areas beyond man’s touch. Remnants of old forest fires are still evident as you make your way up to the top, but the new growth popping up between the burnt stumps reminds a person that life keeps going on. We stopped partway up to Robinson and walked around a logging road for a short time; I went off by myself and let the sounds of the wind whispering through the immense trees wash over me. I stood in a trance. The weight of the world fell off of me there as the sun warmed my face. I could have stood there forever. We looked at the giant pine cones the trees produced and listened to Steve give us a lesson in identifying different types of pines and spruces that bejeweled the mountaintop. Monicka, whom I discovered is another rock hound like myself and one of my besties Laura, had her nose caught between admiring the distant scenery and finding beautiful rocks on the ground. I guess you could say we are all very “grounded” people! We then moved on up to where the first major hold and vet check would be held. 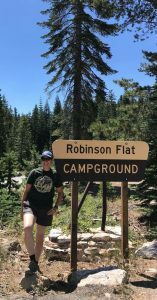 Erin with Robinson Flat sign contrasting the brown paint with insanely white legs. Robinson Flat used to be a forest service station; a couple of the cabins have been preserved and made into displays. Monicka, Steve and I all agreed that we could definitely make a life in one of those cabins; the simplicity and beauty of this place in the world was awe-inspiring. 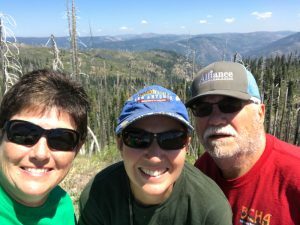 In addition to showing these two where we would be pulsing in, doing our vet check, where we could lay out our crewing station and the rest of the logistics, we wandered around the campgrounds and explored. 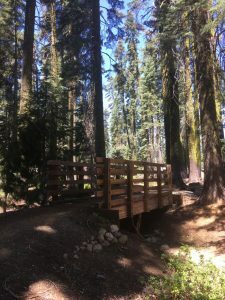 We found a bridge leading to other trails that called my name (I told them I would come back later), looked over all of the varieties of lavender, yellow, pink and white wildflowers we could see in the meadow clearing near the cabins. We examined the bear boxes and looked around the different campsites before picking up and going to Forest Hill. The bridge that calls my name. We wound back down the mountains, all in awe of the 50 shades of green. Steve shared his lessons from his former days in forestry and we listened as we rode along; I think Monicka and I were both lost in the beauty of the trees. Bath Road came up and we turned in. As we walked into the lot where the Forest Hill vet check, waves of history washed over me. The lot itself is empty and quite barren, lined in gravel and surrounded by tall pines, but I could envision the nighttime fervor that had taken place there from last year. In my mind I could see the bustle of activity; stock tanks we cooled Rio in, pulse checkers, tape and cones for the vet check and tons of crew and riders moving here and there getting their horses ready to move out into the night. My skin tingled with joy and anticipation that we might get to come back here if all went well. All of us were hungry and we decided to leave for Auburn again. Much to my delight, both Steve and Monicka also liked Thai food and we had lunch at Royal Thai in Auburn. We spent the rest of the afternoon resting up and preparing for the rest of the week’s adventure. Wednesday would hold more fun, more friends and preparation for Saturday!